Mighty Diamonds were Donald "Tubby" Shaw, Fitzroy "Bunny" Shaw and Lloyd "Judge" Ferguson. They were among the finest vocal harmony groups of the 70's. Their sound was able to give a new shine to old Rocksteady songs from the late 60's. They started their career in 1969 under Pat Francis (the deejay also known as Jah Lloyd) and a year later they featured in some talent shows organized by Tony Mack. Around the same time they cut "Girl You Are Too Young" and "Oh No Baby" for Stranger Cole, and "Mash Up" for Derrick Harriott. During the first years of the 70's they cut some other singles, as "Jah Jah Bless The Dreadlocks" and "Carefree Girl" for Bunny Lee; and "Talk About It" for Lee "Scratch" Perry. The deserved attention came under Jah Lloyd with "Shame And Pride". In 1975 they reached Jo Jo Hookim's Channel One. Here The Revolutionaries, lead by Sly Dumbar and Robbie Shakespeare, were one of the strongest bands around. This debut full length set from 1976 contains some 45's previously recorded for Studio One plus some new tracks and is considered one of their best. The ten songs of "Right Time" ("Right Time", "Why Me Black Brother Why", "Shame And Pride", "Gnashing Of Teeth", "Them Never Love Poor Marcus", "I Need A Roof", "Go Seek Your Rights", "Have Mercy", "Natural Natty" and "Africa") prooved that this was one of the greatest harmony groups of the golden era. This music here is Rockers. The Revolutionaries, which backs the vocals, update perfectly some Studio One classics creating a very satisfying result. Among the 45's already released the most known are "Right Time", "Have Mercy" and "Africa". The rest of the material does not stand below these tracks. This set was produced by Joseph Hoo Kim and engineerd by Ernest Hoo Kim and Ossie Hibbert. Here are the musicians: Anthony "Benbow" Creary, Sly Dunbar and Horsemouth Wallace (drums), Ranchie and Robbie Shakespeare (bass), Rad Bryan and Tony Chin (lead guitar), Ansel Collins and Ossie Hibbert (keyboards), Herman Marquis (alto saxophone),Tommy McCook (tenor saxophone), Don Drummond Junior (trombone) and Uziah "Sticky" Thompson (percussions).If you are interested in Rockers vibes, and in harmony groups, I highly suggest you to check this out. This set is also known as "When The Right Time Come / I Need A Roof". A Dub version of the album was released by Channel One subsidiary Well Charged label as "Vital Dub" and credited to The Revolutionaries. Check their page here. This set standed the test of time: was and is a stellar album. From my point of view this album is very disappointing. If you already checked around through these pages you know that I do not appreciate so much the contaminated sounds. Well, sort of. And this is the case. This 1977 set from Mighty Diamonds was recorded in New Orleans with Allen Toussaint as producer. The man brought Chocolate Milk (anyone?) as backing band and the result is funkysh. If this helps to understand something I add that the result is like a great harmony group put to play on some simple not inspired easy not so much real Reggae. It is not so complicated at the end. It is the right bredren singing on the wrong music. That's all. The producer Augustus "Gussie" Clarke hit the charts with "Rumors" from Gregory Isaacs in 1988. The Wayne Smith's "Under Me Sleng Teng" tune produced by King Jammy in 1985 had revolutionised the sounds setting the digital mood as a mainstream. Augustus "Gussie" Clarke produced two sets for the Mighty Diamonds: "The Real Enemy" and the present set. This synthesizers filled album (with the synths programmed by Robbie Lyn) is a good example to understand how a mid 70's mainly Rockers group as the Mighty Diamonds approached the new sounds. Sustained by the Sly Dumbar, Robbie Lyn and Steve Browne drums from on side, and by the Robbie Lyn and Danny Browne bass on the other, the Mighty Diamonds are able to hamonize over the digital sounds delivering sometimes some good results. 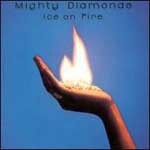 Imagine the classic Mighty Diamonds approach and mix it with some digital late 80's sounds and you get it.